While non-football fans might be more interested in entering to win the $50 TJ Maxx gift card giveaway, here's the perfect portable tailgating bar for your favorite football fan. Just two weeks to enter if you're part of the continental US. Ends 9/12. 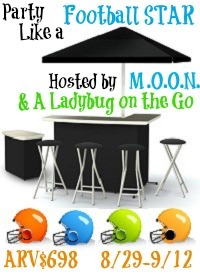 Can't wait to purchase the $698 Ultimate Portable Bar Package? I would like to have the Kansas City Chiefs design. That's my hubby's team and he would love it. Thanks for the chance. I'd choose the 49ers for sure. There are definitely a lot of good choices to choose from. My favorite cover would be either "tiki" or "patriotic." My husband would LOVE the Steelers one!! I like the tiki!! This would be great for the upcoming football season! !Thanks for the giveaway!! would pick cincinnati bengals! these are so awesome!!! my son would love steeler one,big fan! I would choose the New York Giants print, my husband would love it. While I'd love to get a New England Patriot one, I think I'd go the custom route and create something just me. I would go with the WSU I think that is my hubbys school and he would love showing his pride with this. My favorites is the Tiki, I have a Tiki collection and this would be perfect with it! Bring on the party! I would choose the Tiki because I love it!